Monogram "Will you be my bridesmaid?" wine tote bag. This innovative idea makes a fun and unique way to ask your special friends or family member to be your bridesmaids! The bag is designed to hold a bottle of wine and can be carried using the strong handle on top. Silkscreen printed on the front is a sentimental description of a bridesmaid followed by the all-important question. 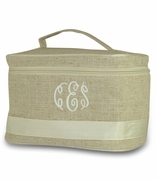 These wine carriers are sure to be kept and treasured as a special memento of your wedding day. Silk screened text on wine totes reads… A woman who is like a sister, a friend in every way. A special person that is asked to share in the brides big day. Will you be my Bridesmaid?? The name will be embroidered.